Back and Forth on the Eddie R. Smear Campaign. Why It Won’t Work. “I too actually LIKED “Jupiter Ascending”. And wrote about it at length on my blog. Click on my name above^ and you’ll get there. I was F.U.N. And Eddie R. brilliant actor that he is, was really quite scarily terrific as the evil queen of the universe. And yes, he was playing camp to the max, but he did it SO WELL. I mean at one moment with the REAL queen(in this movie) of the universe, Mila Kunis, he got actually, totally demonic. And yes, the script required that he scream at the top of his lungs, and vocal range, so he did.And the audience roared. It was a joke, OK? It’s comic. They were SUPPOSEDLY to laugh. There’s good camp and there’s bad camp. I admittedly decided to check my brain at the door, as I say, on my blog. And I did. And I enjoyed it for its’-so-bad-it-good unbelievable factor, and the visuals are stunning. And Channing Tatum? In Imax and 3D? What’s not to like? All this Eddie R smear stuff, by Jeffrey Wells at http://www.Hollywood-elsewhere.com, particularly, is people just grabbing ,as they say, a meme and riding it for all the hits they can get. JW in particular this Oscar season has been complaining how boring it is, because Julianne Moore, J.K. Simmons and Patricia Arquette are soooo locked. And the only movement at all is in the Best Actor race, and JW is VERY afraid that “Birdman” is going to lose everything. Like “American Hustle” did last year. And I think that may be what’s happening. As exalted a source as Harvey Weinstein himself said that Richard Linklater is going to win the DGA tonight. And JW will have a very entertaining meltdown-to-end-all-meltdowns. And his hits will stay high, which is really all he cares about anyway. In case there was some doubt. This is just some posters, some Oscar “pundits”, looking to resurrect Eddie Murphy’s Oscar loss as a “Norbit” moment. This was for his role in “Dreamgirls”, which seems like light years ago. Everybody thought it was going to get nominated for Best Picture, then it didn’t. Jennifer Hudson won for Supporting Actress that year, in what was once again category fraud. She was playing the lead, Effie White. And Eddie Murphy had the TRULY supporting role as James “Thunder” Early, and while he was very good in what he had to do, I always felt he was just missing ONE crucial scene that could’ve locked in his Oscar chances. He lost, famously, to Allan Arkin for “Little Miss Sunshine.” And at the time of the Oscar voting, which is NOW btw, his “Norbit” film opened with him plastered all over Hollywood and creation as a very, very fat black woman. 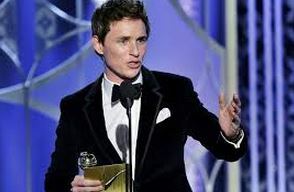 And this was supposed to have lost him his Oscar, and Eddie M. ran screaming from the ceremony. Talk about screaming queens. He immediately left when Alan Arkin won. I wish we had pictures of his more-than-hasty exit. But Eddie Redmayne is a serious actor giving a serious, actually iconic, performance as Stephen Hawking in “A Theory of Everything.” And this smear moment is Jeffrey Wells and others attempts to stop Eddie R.’s momentum going into the Best Actor race, which started yesterday. Jeff you see is all-in on “Birdman”. I hate to think what is going to happen, as I said, in my “Awardsdaily” comment, if “Birdman” loses EVERYthing to “Boyhood” (and to “Grand Budapest Hotel”) and ends up with a goose egg on Oscar night which is two and a half weeks away. Wells actually refers to Stephen Hawking’s wheelchair as “a gimmick”!